This is a reduced mass detent ball that replaces the index detent ball under your shell plate to reduce "snapping" at the end of the index stroke, which can result in spilled powder. Some people run this reduced mass detent ball with a clipped spring, but I have found that leaving the spring alone and installing this along with a Dillon 650 bearing kit is the right recipe for a perfectly smooth stroke. 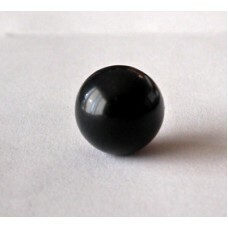 Ball is black phenolic, high quality bearing grade. Phenolic is the stuff they make billiard balls from, so it's a tough wearing replacement for a steel detent ball.